Conference Centre at Liberty Stadium Conference CentreLiberty Stadium, Swansea is the premier venue for conference and events in South West Wales. 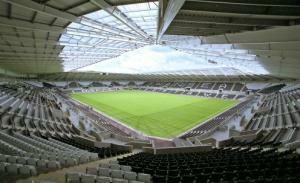 The stadium is also the home of Swansea City Football Club and the Ospreys regional rugby team. Liberty Stadium, Swansea is the home of Swansea City Football Club and the Ospreys regional rugby team as well as the premier venue for conference and events in South West Wales.